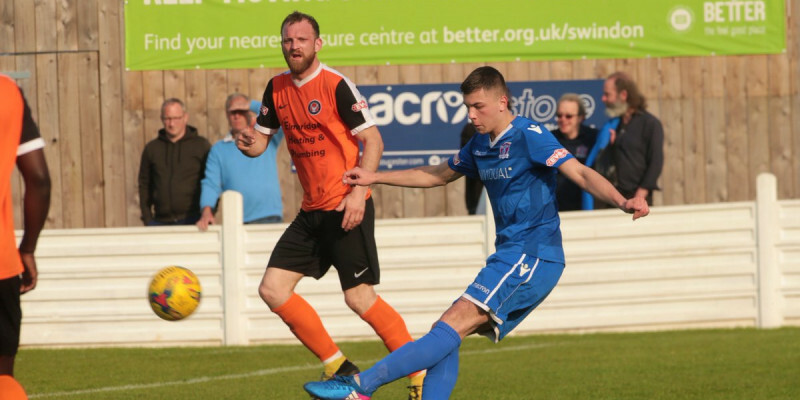 Swindon Supermarine overcame early and late pressure to beat Walton Casuals who finished the game with ten men. The win should see the Webbswood side safe for the season as they now sit on 51 points and 9th in a very tight table, with a 50 point mark probably being one of the objectives back at this level after ensuring safety. It does give the manager an excellent platform to build from for next season if he can build around the nucleus of the team in place right now. Marine made two changes as Mat Liddiard missed the game through illness meaning Matt Coupe made his first start since the Wiltshire Senior Cup Semi-Final win over Westbury United in February, whilst Calvin Dinsley returned from injury to replace Brad Hooper in the centre of midfield. The Casuals started the game very quickly and Josh Hill was in fine form in goal for the home side tipping striker James Ewington’s effort from the edge of the box onto the post before Joe Shepherd cleared an effort away near the line with Hill then making another fine save denying Jay Gasson’s long range effort. Lee Spalding’s men settled down and were 2-0 ahead with their first two chances on target. Henry Spalding finished first time left footed following Ryan Campbell’s excellent run and pull back down the left. Conor McDonagh then extended the lead finishing off a wonderfully flowing attack featuring Calvin Dinsley, Stuart Fleetwood, Spalding and McDonagh himself, who received the ball back from Fleetwood’s backheel, who in turn received the ball himself from a Spalding flick. McDonagh turned his marker inside out and after rolling his studs over the ball on the turn he squeezed his shot underneath goalkeeper Gerrar who could only watch the ball go agonisingly over the line for the second time in six minutes. Fleetwood then sent over a dangerous low cross towards McDonagh but his strike partner couldn’t quite get on the end of it as Marine pressed to extend their lead before the half. The visitors had the second half’s first chance when winger Taurean Roberts forced Hill into an early second half save at his near post, deflecting the ball into his side netting before Spalding curled over from Fleetwood’s centre. Matt Williams was unfortunate to see his header go over from Jamie Edge’s free kick as he made a late run into the box evading his marker. Walton were reduced to ten men as Tommy Brewer was dismissed after receiving a second yellow for pulling back substitute Harry Williams who was sent clear in the left channel. Jamie Edge curled the resulting free kick over the bar but the ten men showed excellent resilience and made a real game of it when James Ewington followed up on Cole Brown’s effort that came back off the post to finish well with a diving header. The returning Bradley Gray almost scored in his return from injury but it deflected just wide as Marine excellently killed the game off following the late scare. “After this win we have now scored seven goals in their last three games, but the winning goals from the 2-1 victory over Walton was the best of the lot.” Said Spalding. The Marine manager highlighted the good work that his front four did throughout and said they were an absolute joy to watch.